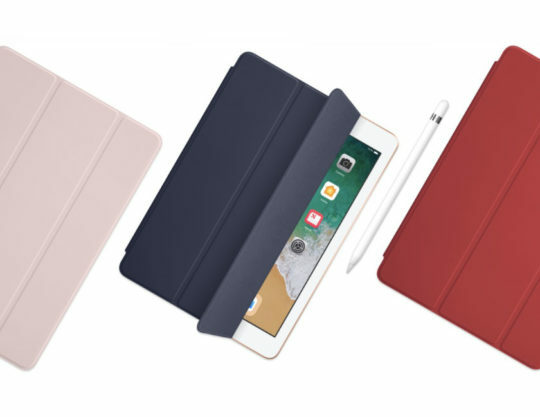 The new 9.7-inch entry-level iPad is aimed at students and education institutions. 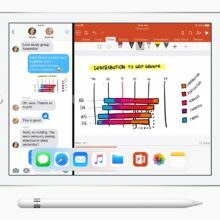 It supports Apple Pencil and costs $299 for schools. 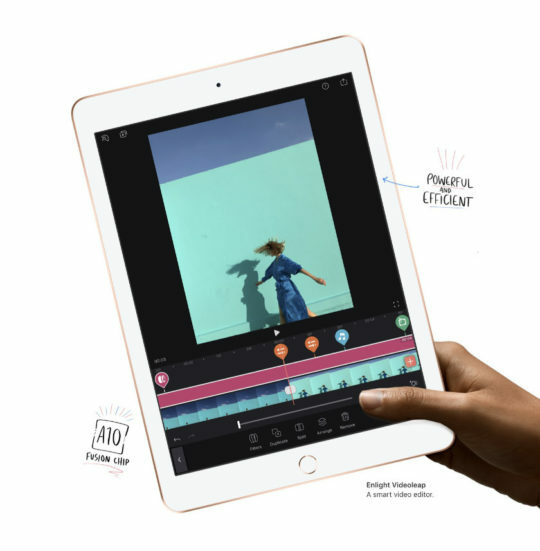 The newest iPad is positioned by Apple as a perfect classroom tablet, giving students the ability to be more creative and productive. 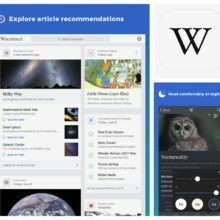 iPad 9.7 (2018) looks and feels like its predecessor launched exactly a year ago. It has the same 9.7-inch 2048 × 1536 px Retina display and the same bezel. Cameras, speakers, buttons, and ports are in the same locations. Touch ID is here, the weight and dimensions are exactly the same. And, despite rumors about a “cheaper iPad,” the $329 price tag is the same as the 2017 model. There are two major improvements. The biggest thing is Apple Pencil support – something only iPad Pro users could have enjoyed so far. The new iPad is also considerably faster, thanks to a newer A10 chip. 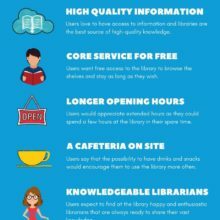 We will talk about these improvements later in this overview. The new iPad is available in three colors: Space Gray, Silver, and Gold. Again, no change, no Rose Gold as in the iPad Pro, same as usual. Wait. If you compare the Gold variant, you’ll see that in the 2018 model the gold finish is richer and more pinkish than in the earlier model. It’s something between Gold and Rose Gold, but much lighter. As the new iPad is addressed to schools and colleges, its education price is lower. For the cheapest variant – 32 GB and Wi-Fi – education institutions in the U.S. can pay $299, instead of $329. We’ll talk more about education pricing later in the post. 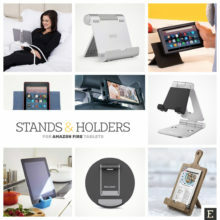 Make the most of the 2018 iPad with keyboard cases, Apple Pencil holders, smart cover alternatives, Bluetooth keyboards, multifunctional sleeves, and more. The new iPad 9.7 comes with an A10 Fusion chip with desktop-class 64-bit architecture. There is also M10 coprocessor, the same as in iPad Pro. 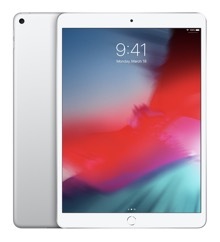 As a result, the newest iPad is delivering 40% faster CPU and 50% faster graphics performance for seamless multitasking and graphics-intensive apps. It doesn’t mean the new iPad is faster than the 2017 model at the time of its launch. We have to remember that in September 2017 iOS 11 was released, offering overhauled – and more complex – Slide Over and Split View features, among others. 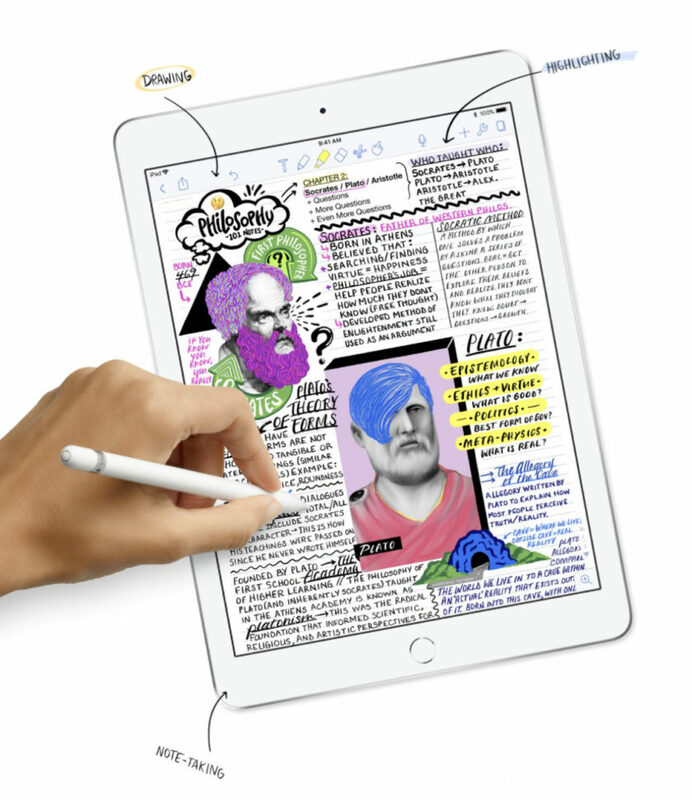 A far more exciting feature is the support for Apple Pencil. Why? 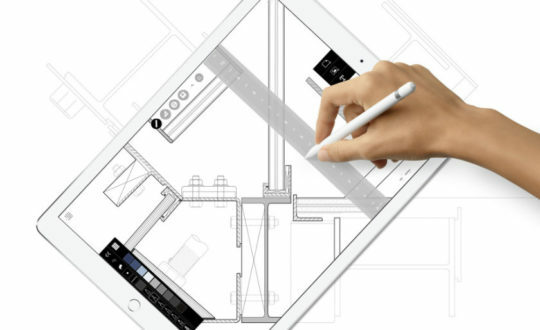 Apple Pencil is not an ordinary digital stylus. The pen’s advanced sensors measure both pressure and tilt. Thanks to that, you can use it as naturally as you do on paper. Give it a different pressure or position it at a different angle, and you will see different results. Advanced technology is one thing. Another thing is integration. You can use Apple Pencil with lots of apps, not only native ones. While it seems like a perfect tool for artists, graphic designers, and photographers, it’s helpful with more common tasks, as well. 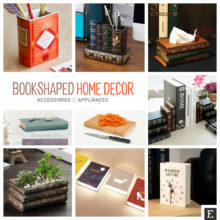 You can jot down notes or doodle ideas. You can instantly write and sketch directly on email messages. And you can highlight and mark up anything. 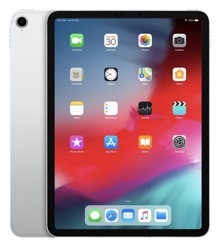 The newest entry-level iPad was announced by Apple on March 27, 2018, at the special education event in Chicago. It’s already available for pre-order in Apple’s online store, and starts shipping to customers in a few days. 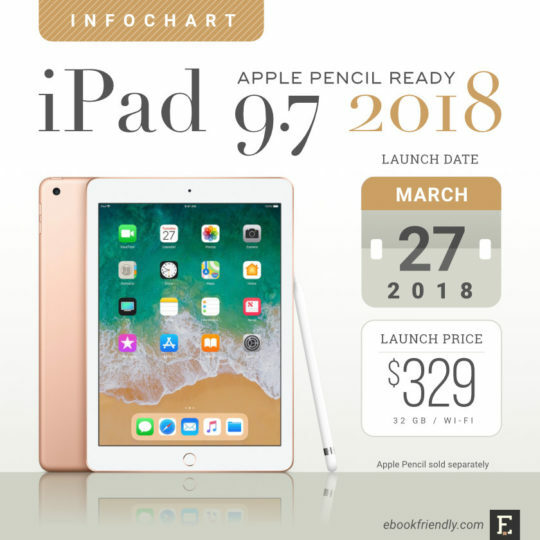 By the end of the week, iPad 9.7 (2018) will be launched in over 25 countries and regions, including the UK, Germany, Canada, Australia, China, Japan, France, Hong Kong, and Singapore. 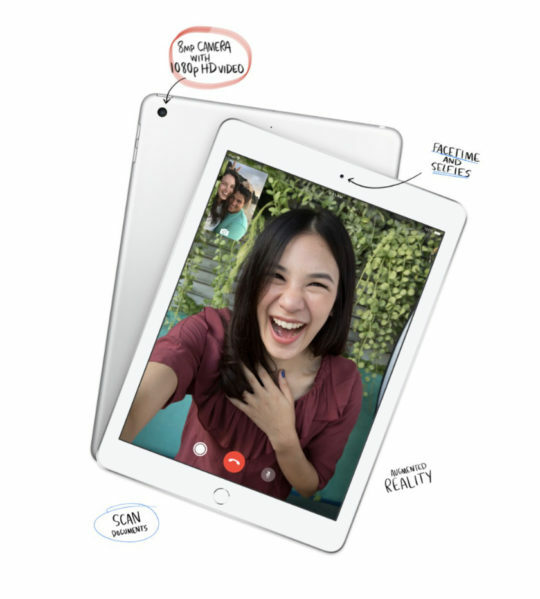 In April, the new iPad will be launched in India, Russia, Thailand, and Turkey. Customers in South Korea will have to wait until May for an official introduction. 128 GB / Wi-Fi + Cellular – $559. 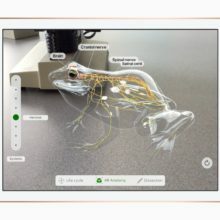 The new Apple tablet is positioned as a perfect device for education. It’s good to stress that all previous iPad models were available for students and education institutions at lower prices. The only difference is that now Apple is saying it out loud. Here are the prices for studying individuals. 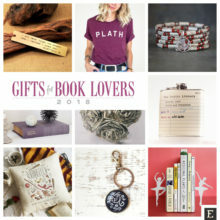 These prices are available to current and newly accepted college students and their parents, as well as faculty, staff, and homeschool teachers of all grade levels. You can save $20 on each variant. Read more about Apple Education Prices for Individuals. 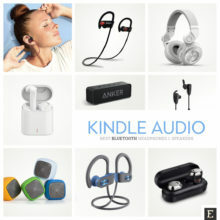 128 GB / Wi-Fi + Cellular – $539. The lowest price is offered for education institutions in the US. The price cut is $30 on each variant. 128 GB / Wi-Fi + Cellular – $529. 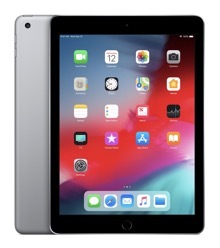 The 2018 iPad model is heavily promoted as a tablet for education, but we have to remember that all other Apple devices and accessories, including iPad Pro tablets, are also offered for education institutions at lower prices. New iPad’s price for schools, set at $299, is nothing to be excited about. 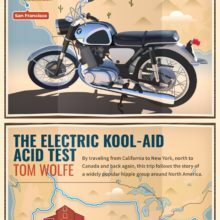 The same price was offered for the previous-generation model. Did you know that? Read more about Apple Education Prices for Institutions. In the table below, we’ll compare the 2018 iPad 9.7, its predecessor, and the smaller iPad Pro, the one with the 10.5-inch screen. 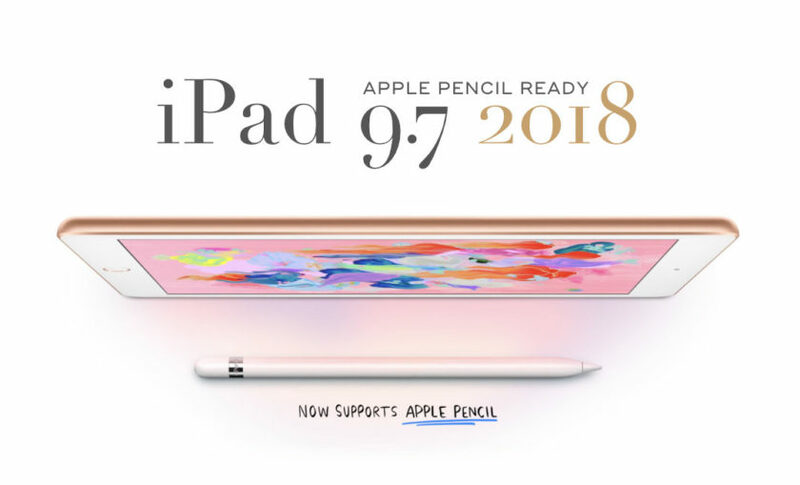 The key factor is Apple Pencil support. 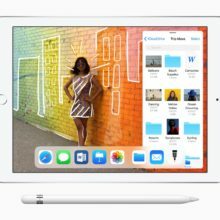 On the surface, it looks like a simple question: Why should you buy iPad Pro 10.5 for $649, if you could have Apple Pencil ready iPad for half the price? None of these devices comes with a free pen, however. 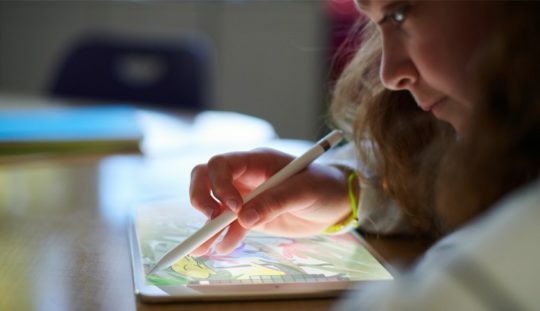 Apple Pencil has to be bought separately, and its price is high. 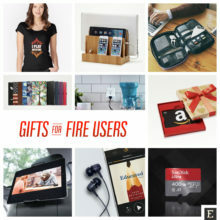 For the regular user, it’s $99. If you are buying it for a school or college in the U.S., you can get it for $89. 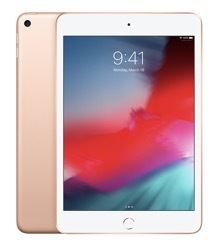 $100 is one-third of the price of the 2018 iPad. 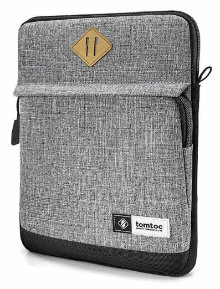 In total, the cost of the new tablet will be well above $400, because you’ll surely want to protect it (a case), and have a way to store and protect the stylus (a dedicated Apple Pencil holder or a special case cover). Last thing to compare is dimensions. 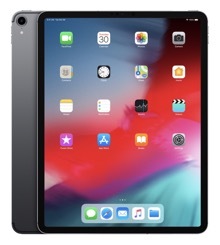 The 2018 iPad 9.7 has exactly the same size, proportions, and position of buttons and ports as the model released in 2017. 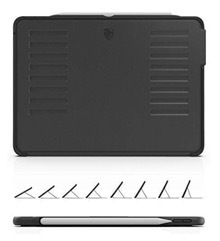 It means you can buy the case designed for iPad 9.7 2017, and with almost 100% certainty it will fit the newer model. 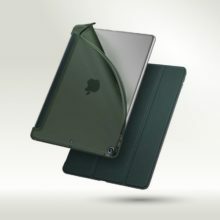 However, since last year, lots of new and more advanced accessories have been launched for the 9.7-inch Apple iPad. 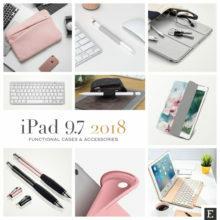 We’ve got a round-up of the best ones here: Most functional Apple iPad 9.7 (2018) cases and accessories. We’ve collected high-resolution pictures of the newest 9.7-inch Apple iPad addressed for students. 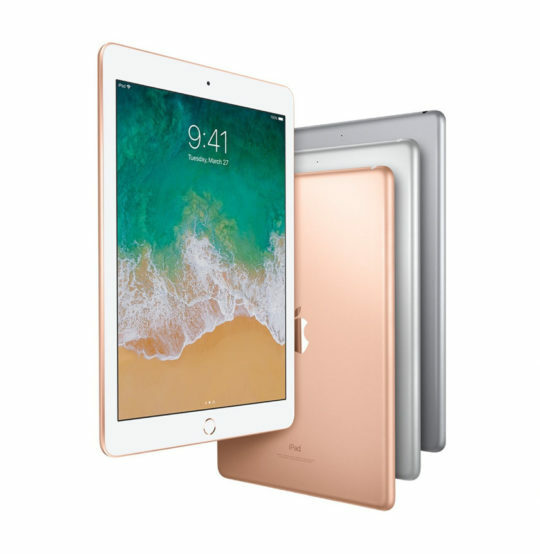 What are experts saying about the newest Apple iPad 9.7 tablet? 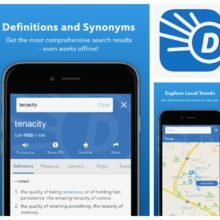 We’ve selected the most insightful review excerpts from around the web. The 2018 iPad has, technically speaking, an inferior display to the Pro line of iPads because it lacks Apple’s “True Tone” display. If you are not a heavy creator type and just want an iPad to do tablet things and maybe sketch the occasional doodle? Then the iPad 9.7 does almost everything the iPad Pro 10.5 does at half the price. My biggest issue with the 2018 iPad is that it effectively makes the iPad 10.5 redundant again. There is a speed difference between the iPad and the iPad Pro, but it’s not so great that I think anybody who buys this will care — or maybe even notice. 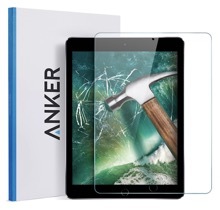 If your iPad is starting to slow down or otherwise become a pain, go out and get this iPad to replace it, and don’t sweat the competition. 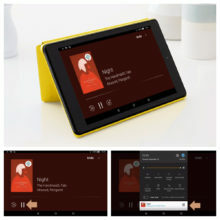 But the addition of Pencil support — here if you want it, but not required — is the icing on the cake of what was already a top-notch consumer tablet. After a couple of weeks with the iPad, it’s proven to be an easy to-go option. Games run great, apps load fast, and battery life has been surprisingly good, even by iPad standards. Combined with the new chip, the formerly capable iPad is transformed into something that’s now a serviceable substitute for an iPad Pro—for a mere $329. In light of Apple’s marketing of the new iPad to schools, the design feels like an exhortation not to judge a book (or a tablet) by its cover. The only real drawback to the new 9.7-inch iPad is that it doesn’t have a laminated display like the iPad Pro, and so you’ll see a visible gap between the display and the glass above it. 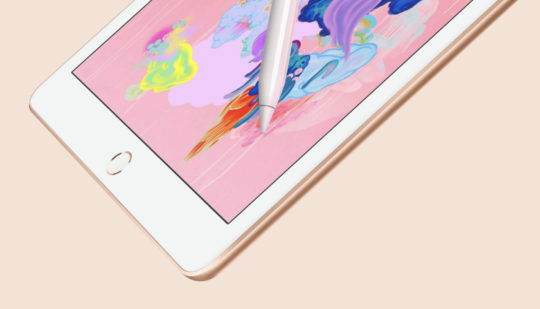 Apple’s lower-priced tablet is almost the same as last year, but with a price cut, Pencil support and very solid battery life we’re not complaining. It’s the VW Golf of tablets: you can go cheaper and get something that works great, but miss out on the level of quality, reliability and finish; you can get something flashier and more powerful, but for a lot more money. What are the detailed tech specs for the 2018 9.7-inch iPad? Check out the complete listing below. And here’s what Apple says about its newest tablet.